Chandigarh 17th May:- We have seen lot of success stories of Sportsperson doing brilliantly and earning a name for themselves. And this film is also a story of one young Player, who captained India and who tasted the success by winning the World Hockey Cup in the year 2016 at a very young age which actually had the real flavor and something one can take inspiration from. And we will not be wrong in saying this that now our Punjabi Film Industry’s graph is continuously going up ant it has started digging the roots by making films inspired by real stories, true incidents,, biopics and now a Film on a Sports Personality, A Hockey Player, A Young Indian Hockey Team’s Captain, Harjeet Singh Tuli and our versatile actor and a melodious singer, Ammy Virk took the responsibility of enacting Harjeet Singh Tuli, In and AS “Harjeeta” which is releasing on 18th May, 2018. The film is made under the banners of Sizzlen Productions, Malika Productions In Association With Omjee Group Villagers Film Studio and whose Producers are Nick Bahl, Munish Sahni, Bhushan K. Chopra, Varinder Kumar and Bhagwant Virk. The Co-Producers are Rupinder Brar and Sarbjit Brar. The Director of the film is Vijay Arora. The story, screenplay and the dialogues have been written by Jagdeep Sidhu. Munish Sahni from Omjee Group who is also the Producer of the film, has taken the responsibility of releasing the film in India as wll as overseas. The star cast of the film includes Ammy Virk, Sawan Rupowali, Sameep Singh, Pankaj Tripathi, Raj Jhinjer, Gurpreet K. Bhangu, Parkash Gadu, Sukhi Chahal and Jarnail Singh. The team of the film was in town today for its promotions. 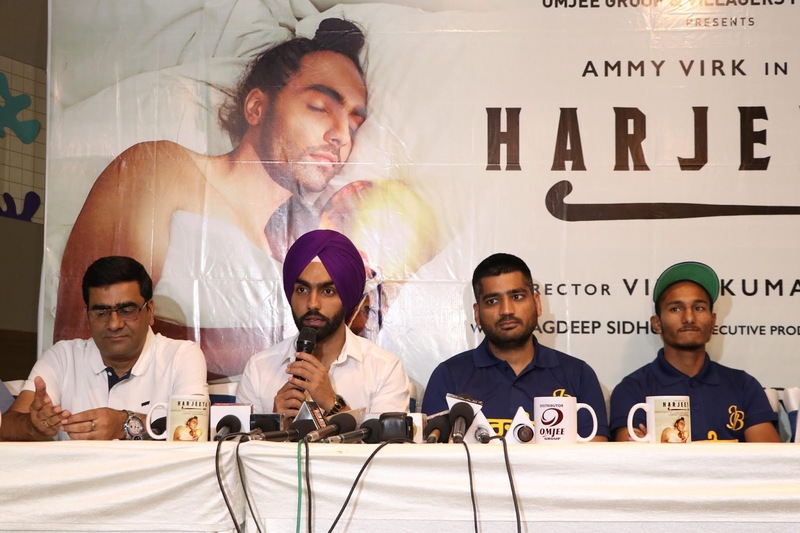 Harjeeta, Ammy Virk, said that the Film is based on the remarkable true story of a underdog, who overcomes his circumstances, fights against all odds and at end, comes out as a winner. He further added that he worked very hard for this transformation of his body shape to look like Harjeet Singh Tuli, he learnt to play the sports with the help of couple of other players and he has that niche and belief that his hard work will be appreciated by the audience as he has tried his level best to justify the character that he has played in the film. The Producers Munish Sahni, Bhushan K. Chopra, Varinder Kumar and Bhagwant Singh also added that they are happy to make this film which is a journey of Harjeet Singh, a youngster who captained the Indian Team in 2016, Men’s Hockey Junior World Cup that went unbeaten throughout the tournament, eventually winning the Gold Medal, that too after fifteen years. They further added, the story of the film revolves around Harjeet Singh and they assured that the this film might bring some change in our Punjabi Film Industry as we as well as the audience have high hopes from this film. The music of the film is composed by very reputed Music Director Gurmeet Singh with The Boss. The lyrics have been penned down by Kaptaan, Harmanjeet and Maninder Kailey. There are four songs in the film. We will hear the soulful and melodious voices of Ammy Virk, Mannat Noor Daler Mehndi and Prabh Gill.